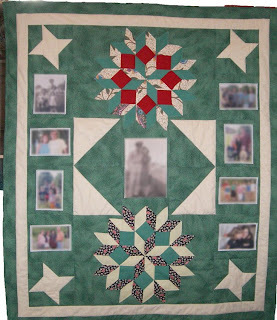 How do you finish your quilts? I think there has to be an easier way? I end up with so many threads after quilting starts and stops. I use one of those easy thread needles and pull all the threads to the back. Then I tie off each set of threads (bobbin + upper) and then I use the easy thread needle again and pull the tails into the backing and snip the excess to hide the knots. This is sooo time consuming. 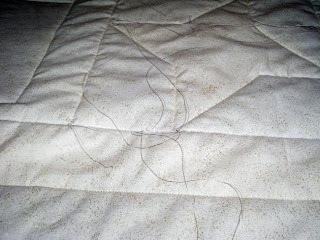 How do you finish your threads, do you just snip without tying? I'm looking for some time saving tips. While wrestling with the above quilt using my regular sewing machine, I came in contact with several pins on the quilt sandwich. When I was fixing my hair, I could not help but see my own personal winking smiley face on my arm in the mirror. You have to look carefully for the right eye dot. Who says quilting is not a dangerous hobby?? 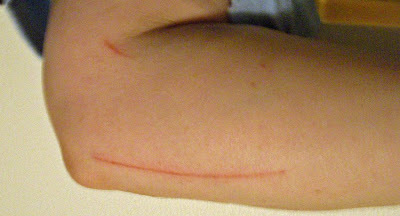 At least your scars are where you can show them--I've had them on the inside of one leg, across a breast--weird--and painful. Those little pin strikes take forever to heal! Your quilt is wonderful though!